"Chai" or "Cha" are the words for tea in several eastern languages. In India and Nepal, "chai" is a daily beverage and refers to black tea that is brewed with aromatic spices and milk. It is usually generously sweetened and can vary in taste and style between regions. We have searched the world to bring you a distinctive cup of chai, in which every ingredient is certified to be organically grown. Choice Organic Chai is certified as organically grown by an independent third party. Every aspect of the cultivation, handling and packaging is carefully inspected to insure the integrity of this product from the gardens of origin to your cup. 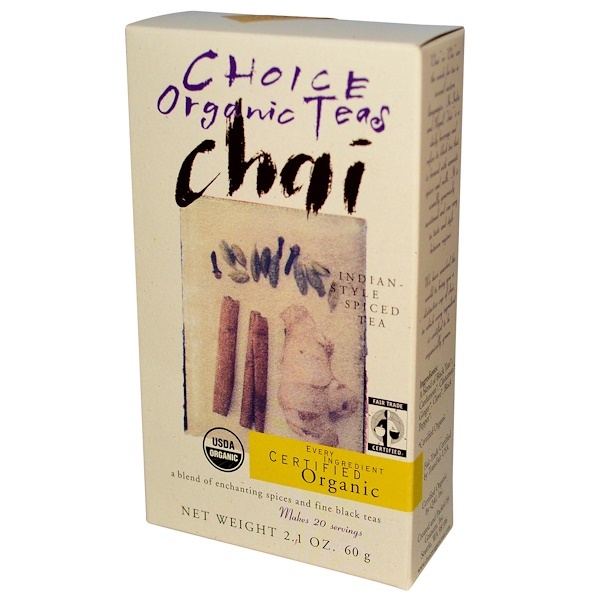 Choice Organic Chai comes from gardens tended by traditional methods, without the use of chemicals. Conscious practice of top soil management and weed control create a balanced environment to alleviate any agricultural problems. Through diligent care of the environment, our growers produce exceptional teas and spices. Combine in a pan 2/3 cup water and 1-1/2 teaspoons Choice Organic Chai. Bring to a boil. Reduce heat to low, and add 1/3 cup milk (or your favorite non-dairy alternative). Simmer 5 minutes, and strain into a serving cup. Add sweetener to taste. Sip and savor. Makes one serving. In a French press pour 2/3 cup boiling water over 1 tablespoon Choice Organic Chai and steep for 5 minutes. Meanwhile, warm 1/3 cup milk in a saucepan. Press, and pour brew into a serving cup. Add warmed milk and desired sweetener. Makes one serving. Experiment with proportions. Use more chai mix for a stronger, spicier tea. Use more milk for a smoother taste. Try adding a dash of vanilla extract to your cup. Or serve it cold. Chai is as individual as the maker. 20 eight ounce servings per package. Settling of the enclosed contents may naturally occur through shipping and handling. 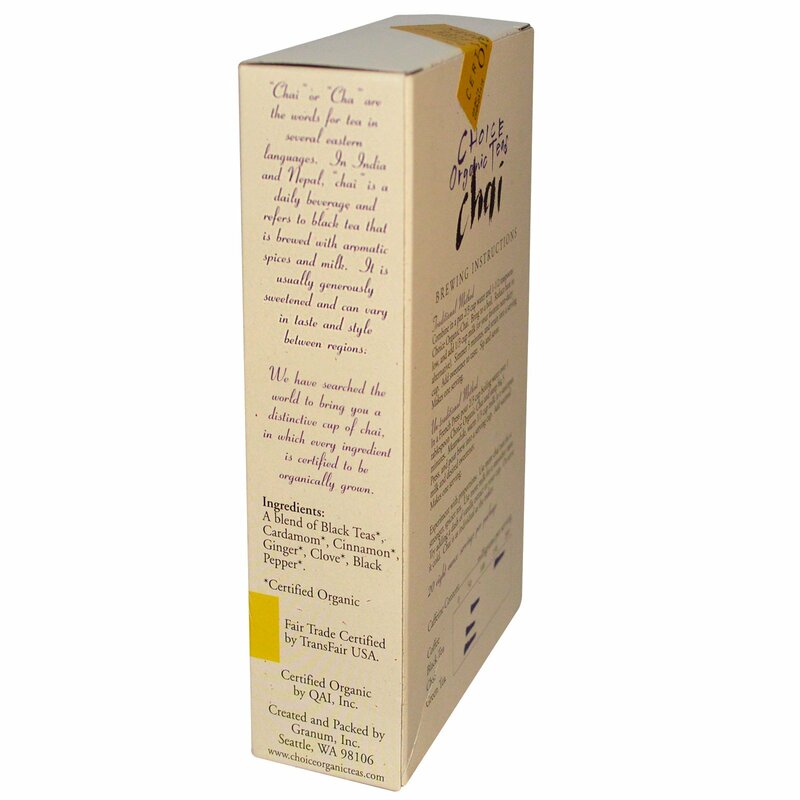 A blend of black teas*, cardamom*, cinnamon*, ginger*, clove*, black pepper*.